Do the families in your parish attend Mass every weekend? Are the parents as active in their children’s faith formation as you would like them to be? Is their faith solid and their command of Catholic doctrine strong? 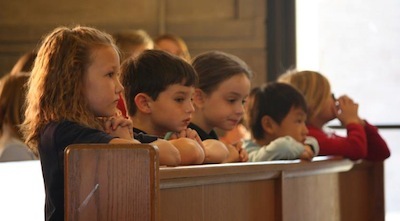 You know that many Catholic parents want to raise faithful Catholic children. It’s not that they don’t care ... they’re just not sure what to do. In many cases, their own Catholic education is incomplete. And today’s society isn't supportive of religious families. What can you do? Give them Partners in Faith — a unique parent involvement newsletter that gives parents the help they need. Partners in Faith helps you strengthen parent participation in their children’s religious education ... with almost no effort on your part. Every issue is personalized with the name of your parish — and your name if you like. That way parents will know you care. DREs tell us parents notice and appreciate Partners in Faith — and you and your students reap the benefits!